Dents on your car can be unsightly. Remove dents with paintless dent repair. Your car will feel like new in no time! Paintless dent repair is a preferred dent removal method because it takes less time and resources. While this dent removal option is simple with your auto body shop, it is only an option if your car’s paint is still intact. If a dent from a collision takes off paint, look into other dent removal options. You will also want to repaint the area on your car to prevent rust. This dent removal option allows you to fix dents on your car without repainting the entire vehicle. This type of dent removal can cost you less and take less time at an auto body repair shop. If the dent in your car is particularly large, you may need a more extensive repair. Not all dents are in easy-to-reach places. 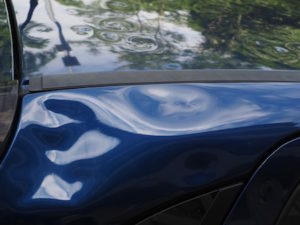 Visit a collision repair shop to fix these dents. You can attempt to remove minor dents from your car on your own. Make sure you have the proper tools for this DIY auto repair project. Consider grabbing a dent repair kit. Quality dent repair kits may not be worth the cost if you only repair one dent, so think about it as an investment for future dent repairs. If you plan on repairing a lot of dented areas, consider taking a course to improve your techniques. Other DIY dent removal options include manipulating the affected area with heat or suction. If you do not have a kit available, you can use a plunger to apply suction to the dent. Make sure your plunger is clean before you attempt this! Other household items used for dent removal can include a hairdryer, a lighter, aluminum foil, or canned air. Heat the dented area and then use the canned air to cause a rapid temperature change from hot to cold. This change in temperature can pop the dented area back into place. Some of these DIY options can lead to further damage of the body of your car’s exterior. If you manipulate the metal layer too much, you lessen its structural integrity. Many car owners find that they remove the dent but then push the area out too far. Once this has happened, your options are minimal. Visit Liberty Collision in Reno for your paintless dent repair! At Liberty Collision, our team provides efficient service on all auto collision repairs. We offer functional and cosmetic car repairs to get your vehicle back on the road in no time. From paintless dent repair to windshield replacement, we can take care of your car repair needs. Visit an auto body repair shop after an auto collision to make sure your car is safe to be back on the road. You may only see cosmetic damage, but even a dent can interfere with sensors on your car. These sensors activate your airbags in the event of a collision. If damage to your car’s body affects the sensors, this can impair the sensors and airbags. Take your car to experts at an auto body repair shop in Reno to get you back on the road safely. Call us at Liberty Collision for a quote on paintless dent repair today!